This is a survey of some statistics for the low version of the Chinese opening. This has become a perennial favourite of pros, as well as being very popular among amateurs. That is, here the komoku stone is mentioned (pK) before the hoshi stone, because it comes at the top in the diagram in the traditional arrangement (Black's stones to the right). 33% S+PK (small sample, nothing since 1989). seberle: According to tapir, H = hoshi = 4-4, S = sansan = 3-3, K = komoku = 3-4 with added qualifiers such as p = parallel (o = non-parallel?). See NamedPoints for point names. These abbreviations need more explanation; the old explanation on SidePatterns is missing. Of course there are other patterns for White. 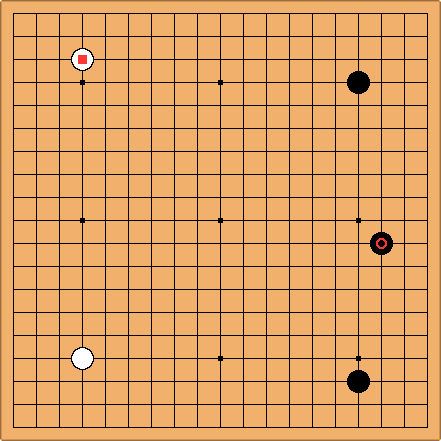 For example H+oK: but then Black rarely plays a Chinese formation (only 3% of the time). The reasons for that are explained elsewhere (see preventing the formation of the Chinese opening). It makes sense to focus on a group of formations like the nine cited above. This is very odd, in the games found. There must be a question mark about , here. 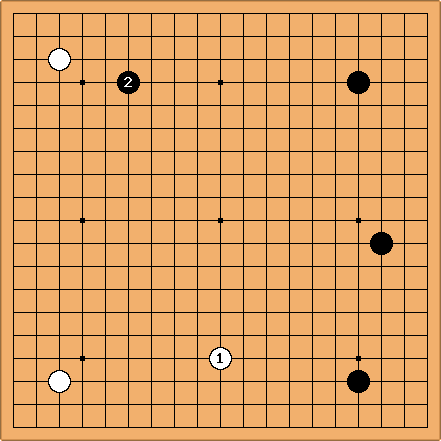 This choice ( ) of continuation for White was doing well until Black played in 1985: and then was dropped. In the past few years at a has been tried (Black winning 2/5 games). seems to have been dropped in 1985 or so, when was evaluated as good for Black. In this case seems less successful than Black at a (leading for example to the Kobayashi formation). After , Black is only winning 44% of games.